There is nothing more powerful than fasting. Though it lasts for a short season, it brings long-term effects and blessings. 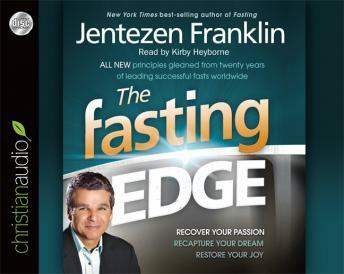 This book is focused on the power of fasting to help you regain your edge when the circumstances of life deplete your spiritual energy and dull your spiritual sharpness. Best-selling author Jentezen Franklin sets the focus for the book by using the story of the student prophet in 2 Kings 6 who lost his ax head while working. The ax head flew off the ax and landed in a dirty, murky pond and sank to the bottom. Through this biblical example, Franklin will give us the steps to regaining our edge, which include: 1. Make up your mind to admit it is lost. 2. Confess that you have lost it. 3. Confide your loss to someone in a spiritual position to help. 4. Go the river (point of losing it). 5. Watch the power of God make your lost edge swim to the top of the murky river. 6. Pick up the ax and put it back on the ax pole (our part in regaining our edge; God will not do it all). Fasting Edge: Recover your passion. Reclaim your purpose. Restore your joy.